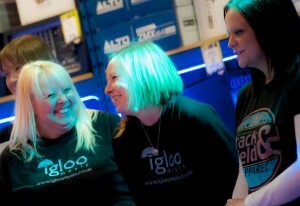 Keep an eye on the Igloo Calendar, or join the Newsletter for updates! Looking for a Gift Voucher? Click here. We give people of all ages a wonderful experience of music! Join any of our friendly groups, choirs and workshops in Portsmouth and across Hampshire or book group or individual music lessons with our fun, talented music teachers. We guarantee it’ll be great for your health, brain and social life! Whilst we teach people of all ages, we are really well known for helping reluctant, nervous adults rediscover a childhood passion, or unleash the singer within. Or just learn a new musical instrument for the pure enjoyment of playing. Our wide range of music lessons includes instruments like the guitar, ukulele, bass guitar, piano, keyboard and drums. We also provide singing lessons and have our very own choir. The lessons and events are held in various surrounding Hampshire area including Wickham, and Havant. For more information on any of the upcoming workshops, music lessons and events call Igloo Music today on 023 9200 6507 or browse the Events Diary on the website. please find the instructions for the shopping cart here.